Bulbs, tubers, perennials and indigenous plants beautify your home and give year-round enjoyment for decades to come. If you bought your home in the fall or winter, you may not know what is under the snow or mulch, but you can prepare for spring planting anyway and liven up the atmosphere with color inside your home as well. Bulbs and tubers planted in the spring typically bloom in the summer. To get a head start on those blooms, consider forcing bulbs indoors. There are two types of bulb: those that are native to warmer climates and those native to colder climates. A warm climate bulb, like an amaryllis or paperwhite narcissus can be grown indoors without chilling in a pot or shallow bowl and then transferred outdoors when the weather warms. Amaryllis come in reds, whites, pinks, peaches and yellows. If you like, you can grow these bulbs in soil or simply in a shallow bowl with pebbles and water to hold them in place. They usually bloom about four weeks after you begin watering them. It is ideal to keep stems short so that they remain sturdy. To do this, keep them in indirect light and temperatures around 50°F for the first couple of weeks. Move them to a lighter, warmer location after that. Cooler climate bulbs require chilling at temperatures of 35-45°F in order to stimulate the bulb to start developing. Most of these bulbs need four to five months of cooling before they begin developing and forming flowers inside the bulb. 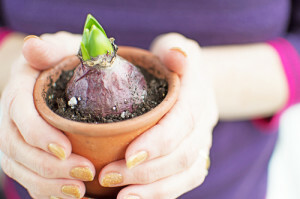 If you don’t already have bulbs, consider purchasing pre-chilled bulbs from a nursery. Once you expose the bulbs to warmth of around 60°F with indirect light, either indoors or outdoors, they will begin blooming in about three to four weeks. When you have shoots between three and five inches high, you can move them to a sunny window. Once the buds have color, if you are keeping them indoors you should move them to indirect light and they will bloom longer. Great cooler climate bulbs include tulips, hyacinths and daffodils, all of which come in a variety of colors and have fascinating names like Apricot Beauty (tulip), Negrita (purple tulip), Orange Emperor (orange tulip), Peter Pan (while crocus), Pickwick (striped crocus), Bridal Gown (double creamy daffodil) and February Gold (miniature yellow daffodil). Other “bulb-like” plants are actually tubers (like potatoes) and tuberous roots (like sweet potatoes), corms or rhizomes. For example, a crocus is actually a corm. Other corms include gladiolus and freesia. Begonia, anemones, caladiums and cyclamen are tubers, while dahlias and daylilies are tuberous roots. Begonia and caladiums make great indoor blooms. Rhizomes include tiny delicate blooms like lily-of-the-valley and the tall brilliant flowering stems of canna. Irises are a creeping rhizome which means that they fill in space in dense clumps year after year unless separated and replanted further apart. There are more than 300 species of iris, but the best ones to grow indoors are the dwarf irises. They need to be chilled for about eight weeks in barely moist soil and shoots will form before you need to bring them into a sunny location. Forcing bulbs, rhizomes, corms and tubers indoors means that you can add a bright spot of color to your flowerbeds as soon as the weather warms.